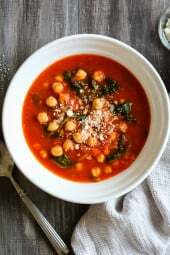 This Chickpea Tomato Soup is an easy, hearty soup, loaded with chickpeas and vegetables in every bite. Stove, slow cooker and Instant Pot directions provided. I love hearty soups with legumes such as this Minestrone, and this 16 Bean Soup with Ham and Kale (so good!). 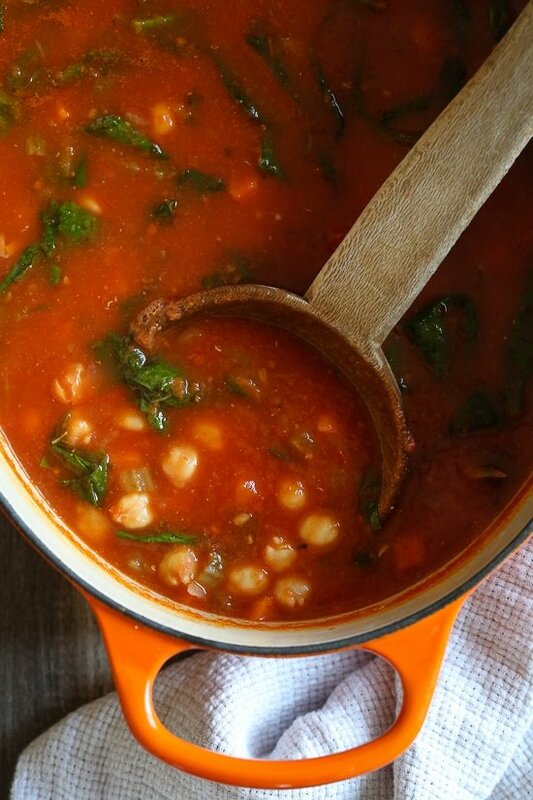 This chickpea tomato soup is so flavorful and perfect for a cold winter night. Chickpeas (garbanzo beans) are loaded with nutrients such as fiber, protein and vitamins so it’s also a nourishing meal. Leftovers freeze well so it’s also a great make-ahead meal and perfect to pack for lunch on the go. I adore chickpeas and have been making this soup a lot, especially now that chickpeas are 0 Smart Points on the new Weight Watchers Freestyle plan! My husband on the other hand isn’t a fan of their texture, but he loves the soup! Heat oil in a large nonstick skillet over medium heat. Add the carrots, celery, onion, garlic and saute until tender and fragrant, about 6 to 8 minutes. Transfer to the crock pot along with the broth, tomatoes, chickpeas, parmesan cheese, and pepper. Add the rosemary, bay leaves and basil, cover and cook on low for 6 hours. When done add the spinach. Remove bay leaves, rosemary sprig and season to taste with salt and black pepper. Ladle soup into bowls and top with extra parmesan cheese if desired. Heat oil in a large pot or Dutch oven over medium heat. Add the carrots, celery, onion, garlic and saute until tender and fragrant, about 6 to 8 minutes. Add the broth, tomatoes, chickpeas, parmesan cheese, and pepper. Add the rosemary, basil and bay leaves, cover and cook on low 30 minutes. Add the spinach, cover and simmer until wilted, about 2 minutes. Follow same recipe as above except cook 15 minutes high pressure, natural release. Loved this soup. Simply delicious! Thank you for this recipe and your meal plans. This soup is delicious! It is just as wonderful leftover from the freezer. this is so good. And it’s better after a day or two where the flavors meld. This was delish! I added sliced avocado at the end and it put it over the top! Yum. Thanks again Gina! I’m eating a “test” bowl of this now. It has all the flavor I was hoping for. I seriously never have had a chick pea in my life. (I’m 57) but it sure makes a good nutritional filler in this soup. I ended up blending things down a bit with my immersion blender but left it a bit chunky, not totally smooth. IT’s very good. I’m sure my husband will think it’s a winner too. I love this recipe. I have made it many times. Unfortunately, I’m the only one in the house who likes tomato based soups. It is a lot for one person to eat. 😊. It does freeze well. I leave the spinach out, freeze it inindividual containers and add spinach after I thaw it out. Gina, I made this last night; used frozen spinach and threw in a bit of quinoa I had in the fridge, otherwise followed the recipe exactly. It was delicious! I kept telling my husband (whom I couldn’t convince to have any since he’s not a fan of chickpeas) “This soup is SO good!” Thank you so much for your wonderful recipes! Made it as is except used the full quart of chicken broth and cooked for one hour. Didn’t think the tomatoes were cooked enough in 30 minutes. Overall a delicious bowl of comforting soup! can broccoli be substituted for spinach? We’re eating this right now and even my boyfriend likes it! Absolutely delicious and filling and so extremely easy to make. I’m going to save this recipe for sure! The only thing that I’m missing would be using grams and ml for the ingredient measurements, it’s a bit tricky to convert US measurements into european measurements on the fly. I made this for lunch today and it was fantastic!! Used my Instant Pot. Super easy. And substituted arugula for the spinach since that’s what I had in hand. Thanks for awesomely flavorful low WW pt recipes, Gina!! Oh my gosh – this soup is absolutely amazing! Hearty and such fresh tomato flavor. I did toss in some Italian seasonings and a Parm rind (highly recommend). Next time might add some chopped zucchini. I will be making this frequently! ???? Made recipe using fire roasted crushed tomato. Wonderful! Making this for dinner tonight and discovered I only have beef broth, will that be okay? Love all of your recipes by the way. If I need to use dried rosemary and basil, any clue how much I should use??? This was so yummy! I added shredded chicken breast and diced green pepper and a dash or two of cayenne pepper for a little kick! Thanks for the recipe! Do I have to cook longer in the instant pot if I double the recipe? I loved the soup! But the rosemary sprig all fell apart and I had to fish out all the little pieces from the soup. Did that happen to anyone else? I wrap my fresh herbs in cheesecloth and immerse the entire bouquet into the soup so it is easy to fish out and the herbs don’t fall apart. I’ve had this soup on rotation for the last few months. The only change I made was to use lacinato kale instead of spinach. It is so filling and the rosemary and Parmesan rind add great flavor. One of my favorite lunches – thank you!! What’s a good side to make with this? Delicious. I made my own beans in the pressure cooker and then used them in the soup. Great rexipe! Another great recipe to add to my Instant Pot list! Modifications: substituted 1/4 cup lentils for one can of chickpeas because I forgot to buy 2 cans. Used dried basil instead of fresh. Next time, I would add in a spoon of tomato paste and a squeeze of lemon after. Would this also work if you blended it Witt immersion blender at the end? The flavor in this soup is fabulous! I only had one can of garbanzo beans, so for the second, I subbed 1 can of cannelini beans. While the veggies sauteed in the IP, I defrosted a package of frozen spinach in the microwave, squeezed out the excess water, and added it in with the rest of the ingredients. Super quick, super easy, super delicious! My husband is obsessed with your round wooden spoon we’ve seen in a couple recipes of yours. Do you remember where you bought it? We can only find oval ones. Is this recipe good for freezing? Hubby and mil don’t really like garbanzo beans. And would I add the spinach initially or while reheating from frozen? Thanks! And I can’t wait to try this! I just made this, and it’s super tasty! I used vegan parmesan but otherwise followed the recipe. Another winner from Skinny Taste! 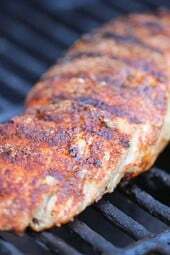 Thoughts on how to add meat into the recipe? Do you think I could use kale in place of the spinach? I want to make this soup then freeze it. Should I put the spinach in when I’m heating it up after freezing it? Gina, this recipe reminds me of your beef, tomato, and acini de pepe soup, which I absolutely love. Does it taste similar at all? No beef so not the same but my husband who doesn’t like chickpeas loved it! I popped the ingredients into the WW recipe builder and still came up with 7 points/serving based on 6 servings for the recipe. The chickpeas alone (30 oz for 2 15 oz cans) are 34 points (5.66 points/serving at 6 servings/batch). Olive oil is 1 pt., chickpeas 34 points, broth was 1 point (I used ff vegetable broth), shredded parm 3 points. 39 points total, for 6.5 points/serving. A 15-oz can is equal to 1.5 cups drained chickpeas, so I calculated with 3 cups cooked chickpeas which is 20 points. Interesting. I had calculated with the oz, but when I do with 3 cups (“Chickpeas (garbanzo beans), canned, drained”), I’m still getting 31 points for the chickpeas alone. Anyone try this with nutritional yeast instead of parm cheese? Sounds wonderful! Hi! Do you think it would be okay to cook this recipe using a crockpot on the “high” setting? If you do, how long would you cook it on high? Sure, 3 to 4 hours should be good. Made this yesterday (Sunday). It’s clearly super healthy but my taste buds found it too tomato-y and I love tomato soup, as a rule. Not sure what I could do to add some depth. Maybe a teaspoon of cider vinegar or balsamic? Or would that make it sour? I’ll make it again but maybe reduce the tomatoes or use diced instead of crushed. Maybe fire roasted tomatoes? Maybe add diced zucchini? The recipe has amazing possibilities and I like that it made a huge quantity. Enjoying some for lunch right now., with an apple and a spoonful of nut butter for added protein . The only change I made in y’day’s version was to use collard greens instead of spinach, which I find is sturdier and holds up better than spinach. Mine won’t eat legumes for the texture, but kids are all different! 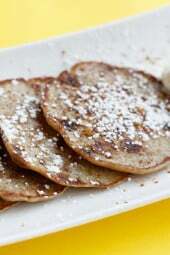 Hi, I follow the Weight Watchers program and I’m always looking for recipes that are Smart Point friendly. I calculated your recipe and it’s not 4 Smart Points it’s 7. You may want to make that change. I have to say I love the Skinnytaste site and I will continue to make the recipes but I will calculate them just to make sure the points are accurate. Hi Gina, so I see your response to the difference in SmartPoints between what you indicate and what we get when we plug in the the nutritional value, thank you for clarifying that. So what I’m understanding is that you have done the “leg work” for us and your total SmartPoints is after plugging in the info via the Recipe method, which in turn means we can rely on the points you indicate, and that is what I’ll do given you’ve been doing this far longer than I’ve been on the plan. Thank you by the way for that work, it makes my journey a little easier! Made this last night and it was soooooo delicious and surprisingly filling! Just rejoined WW again so looking for SmartPoint friendly recipes and this one really fits the bill! I tweaked it just a tad – I brought it to a boil after adding the liquid ingredients (and before the herbs) for a few minutes to cook down some of the tomato (the directions for the stove top didn’t say anything about doing this but I thought it should have). I also added one 15 oz can of diced tomatoes for textures (in addition to the crushed tomatoes). Didn’t add any points. My husband loved it too! Anyway, delicious soup dinner — I just wish I could have had some crusty bread with it but this new WW plan is very anti-carbs. Thanks! Excellent soup! We made it for lunch today and bookmarked the recipe! I’ve made this soup twice. It’s my new favorite soup! I felt bad using only 3 cups of broth when the box I buy comes with 4 cups (didn’t have anything planned for one cup and would have thrown it out), so I used the whole box of broth the second time I made this soup and it didn’t change a thing. Tasted the same as the first time. Really great soup! Thanks! 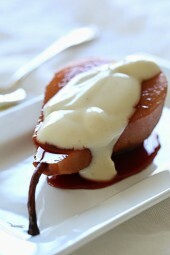 I’m making this tomorrow. Looks so yummy. Have you used the slow cooker option on the Instant Pot? Have you ever tried freezing the leftovers? I’ve never frozen soup before and wasn’t quite sure if the chickpeas would have a funny texture after unthawing. No I haven’t, let me know if you do! It’s 100% perfect after freezing/thawing! Well I forgot to put the spinach in and it was good with out too. Oops! Haven’t met a soup or chili of yours I haven’t liked! Any recipe for that matter. I am going sauté the spinach and then add to my leftovers. I’m not sure why on this recipie the smart point value is not correct. When I submit all the information into WW app it is a 7 point value. Has anyone tried freezing this soup for leftovers? Yup! Works great. I was leaving on vacation and put the leftover soup in the freezer for ~2 weeks and then defrosted it as soon as I got back for an easy dinner for the following 2 nights when we were unpacking! Just made this & followed recipe. Having a bowl for lunch- delicious!! Even husband approved. Will definitely add to my soup recipes! Hi! I am going to make this tonight in my instant pot. Should I put the spinach in before or after pressure cooking? Thanks!! Perhaps add this note to the instructions for the instant pot? I’ve been a fan of yours for a while, and, now that I am vegan, I see that you have recipes that I can make! I won’t lie, this was the first thing I’ve eaten in three weeks that tasted like human food (and the vegan parmesan was actually good). Sometimes things happen to us that require we make an abrupt change in our diet. Thanks for making it a little easier, Gina. This was absolutely delicious- the whole family loved it! Oh gosh! This is so good. I’m trying to start the New Year off on the right foot, so I just made a pot that I’ll be taking to work this coming week for lunch. Apparently, I picked up a can of tomato puree by accident instead of crushed tomatoes, but I dumped it in anyway and didn’t spoil it. I love soup. Looking forward to trying the cauliflower/tumeric that was recently posted.Thanks Gina! How long do you cook it in the slow cooker on high? Can’t wait to make this for dinner tomorrow – I’m going to put it in the crock pot while I’m at work all day. I only have dried rosemary, any thoughts on how much to use? I’ knows it’s usually 1/3 of the amount of fresh so maybe start with a teaspoon? Just made this for dinner! Followed the recipe exactly. I LOVE it! So full of flavor and hearty! Thank you for this recipe. Perfect on a rainy night like tonight. So glad you enjoyed it Shelly! This is delish! I made it with no changes except to replace the basil with a couple tablespoons of pesto. My vegetarian daughter gave it a thumbs up. Quick and easy. I just made this and am now enjoying it for lunch. Fantastic, so much flavour! Thanks for this awesome recipe. Sounds great with some toasty baguette to accompany it. Chickpeas and parmesan is a great match. I also like to save my old parmesan rinds, and let them cook in soups or tomato sauces, they lend that special parmesan undertone and don’t go to waste! Thank you for adding instant pot directions to your recipes.. Plus thank you for the recipes. I cook from your books and site every week. Sounds delicious! Any idea if frozen spinach will work just as well as the fresh? Love all your recipes!